Digital transformation has been real, it brings a lot of opportunities and threats to the actual business world. More and more traditional manufacturers and retailers are trying to adopt the latest ICT in their business, whereas entrepreneurs would also seek opportunities to design new systems and combine ICT to their business from the beginning. When there are tons of new technologies invented every day, creating a borderless digital business world, there are also issues of security, trust, stability and so on. To strengthen the knowledge of doing business under digital transformation, HKFEC co-organizes the seminar with Department of Economics of HKBU, to further prepare for the digital age. 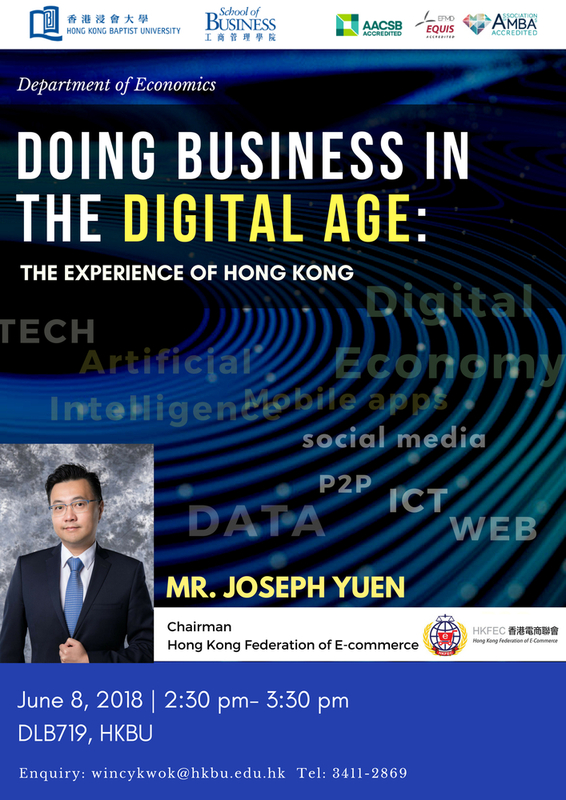 Our chairman, Mr. Joseph Yuen, will discuss the opportunities and threats of e-commerce, along with master students of HKBU. For any queries, please do not hesitate contact to Ms Wincy Kwok at 3411 2869 / wincykwok@hkbu.edu.hk or contact us at keith@hkfec.org.